Since getting back home from our road trip to LegoLand in Southern CA, the garden has been providing the veggies for dinner every night. Just this weekend we got our first 80 degree days in months, but even so, last week the temps were in the high 70's, which the garden absolutely loved. 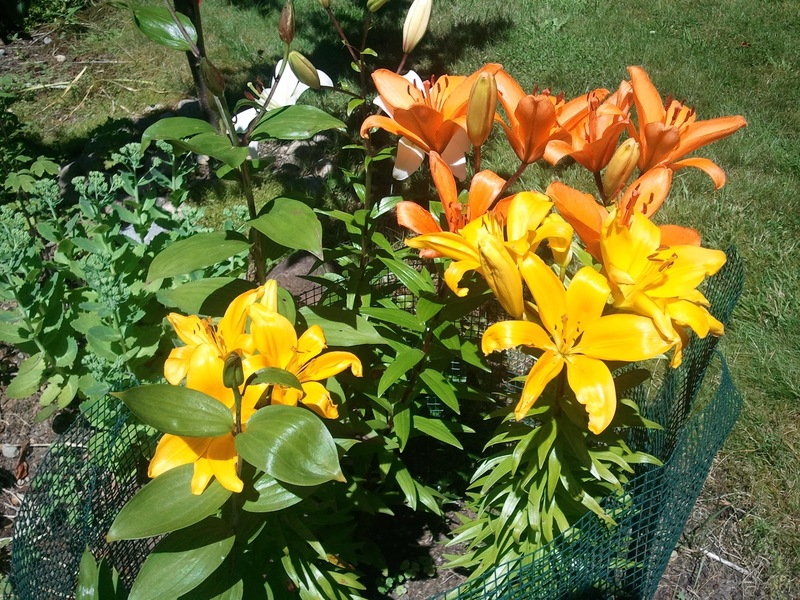 As a result the flowers and veggies decided that summer had in fact come to the PNW. Almost daily, I can pick enough green beans for everyone to have a scoop or 2 on their dinner plates. My pea plants are still producing some snap peas since it hasn't gotten too hot here, and the yellow squash and zucchini give me a good sized fruit to pick almost every day as well. 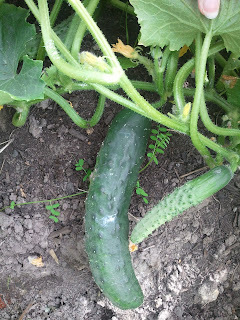 The cukes are starting to make something big enough to pick, and I have enough chard and kale to last me for years. The root veggies are also ready to pick. I dug up a couple of handfuls of potatoes the other day, pulled up most of the beets and most of the carrots and all of the rutabaga. We will eat the beet greens along with the kale and chard; I like to roast them with a little olive oil, salt and lemon juice. This year I planted 3 kinds of cabbage: red, green and savoy. I've picked a couple heads of the green cabbage, but the others aren't forming heads yet. 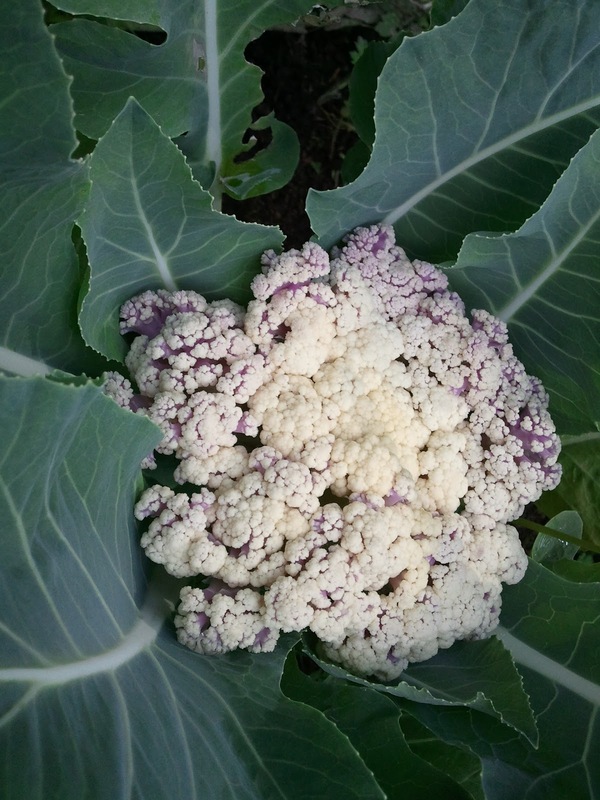 I also planted cauliflower for the first time this year. Every plant produced a head; they were all fairly small but very tasty. I'll definitely plant cauliflower again next year. 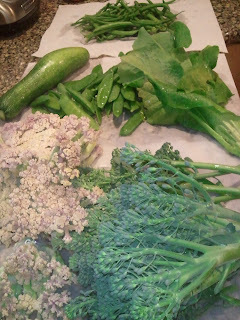 And my broccoli did fairly well this year, too; I'm still picking side shoots almost every day. And believe it or not my tomato plants have tiny green tomatoes on them! Maybe they'll turn red before it gets too cold outside. 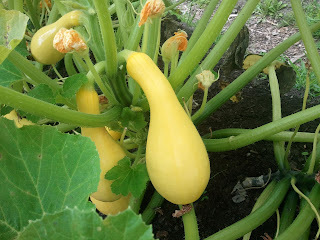 I think the only plants that I grew this year that were failures were the melons. I planted both crenshaw and honeydew melon, but so far the plants are tiny and have no real chance of setting fruit. I think the lack of heat in my garden just isn't conducive to growing melons of any type. 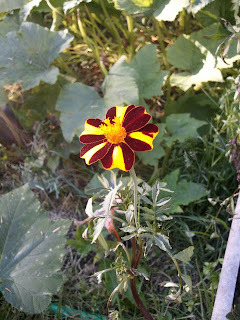 Maybe if I tried them up near the house by the tomatoes they would do better...something to consider for next year. I also planted a couple types of marigolds, sunflower and calendula to try to add some color to the garden and attract bees. 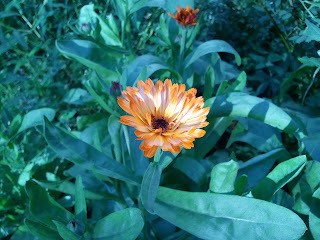 It definitely add something pretty to the garden, but I'm not sure if it brought in the bees. We've talked about getting a couple of beehives, but haven't made any movements in that direction. So I guess that's a discussion for another year.